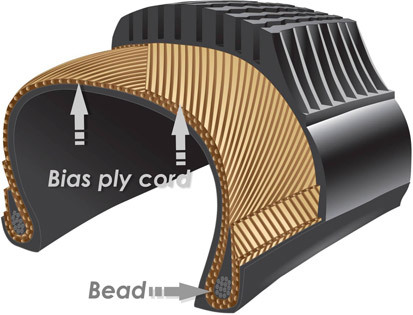 Bias ply – In a bias ply tire, the nylon /aramid cords (plies) run at a 45-degree angle from bead to bead. This diagonal pattern is crisscrossed with each layer of ply cord contributing to a very rigid structure, all designed to work as a single unit. Radial Steel belt – A radial tyre is constructed in two parts. The casing has one ply layer 90 degrees to the bead . On top of this are several rubber-coated steel plies that make up the steel belt. These are placed directly beneath the tread to stabilize the crown. Which tyre is best suited to your needs? There is no definitive answer here and the choice of construction should be determined by your riding conditions and preferences. Bias ply for Off-road use and lower speed Tar use. Bias ply tires have a number of fabric plies making for a thicker sidewall with improved sidewall cut resistance. These plies also contribute to a stiffer sidewall, making it more difficult for an object to penetrate. Conversely, a radial tyre sidewall deflects more easily making it more susceptible to rocks and other foreign objects. However, in the crown area,  radials are more resistant to cuts and penetrations due to the steel belt. We would recommend bias ply tyres for off-road use (where sidewall punctures are a more common occurrence) and radial steel belts for road use (where punctures in the tread area are more likely). Bear in mind however that tread depth also has a bearing. 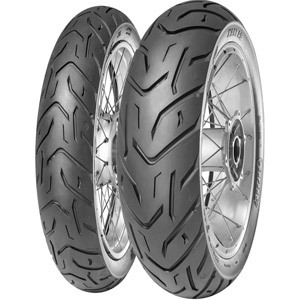 Most bias ply dual sport tyres have a deeper tread pattern which will assist in preventing punctures in the crown area. Road biased radial tyres do not have such tread depth and will rely more on the steel belt for tread puncture resistance. 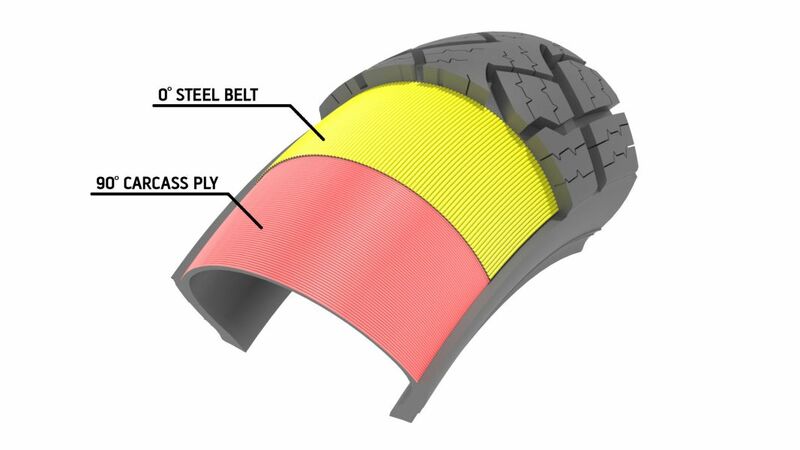 A bias ply tyre is constructed as a single working unit making an interdependent relationship between the sidewall and crown of the tyre. 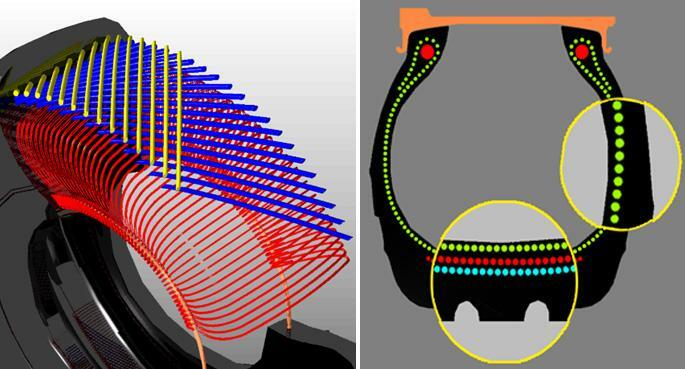 When the sidewalls deflect, the tread squeezes in and distorts causing a change in the footprint pattern. Such characteristics are more suited to off-road riding where the nature of the terrain (and tyre pressure) varies. A bias tyre consists of multiple  plies overlapping each other. The more plies the stronger the tyre. 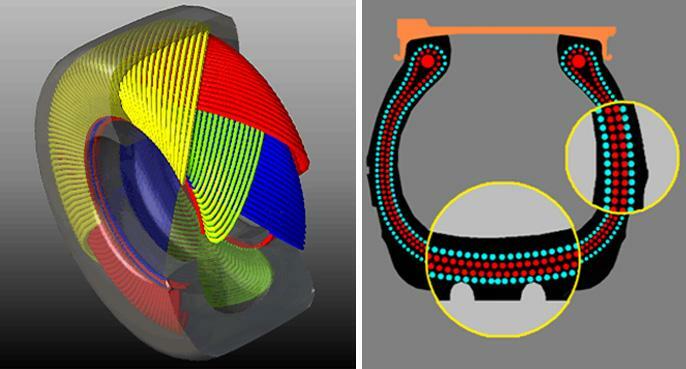 The crown and sidewalls are interdependent. Sidewall flex is not transmitted to the tread. The footprint only lengthens. The radial tyre allows the machine to transfer more power to the ground, contributing to more even wear and longer tyre life. 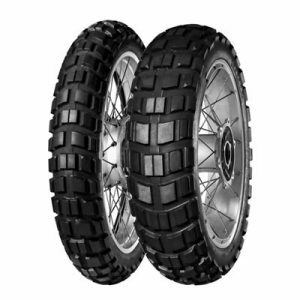 Radial tyre construction allows the sidewall and the tread area to work independently of each other. This allows the tread to sit much flatter on the ground and have a more evenly distributed contact patch. Radial tyres have a bigger constant footprint, stiffer crown and distribute weight in a more uniform manner, making them ideal for high-speed road use. 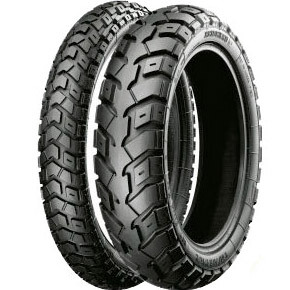 Ride quality varies between radial and bias ply tyres. 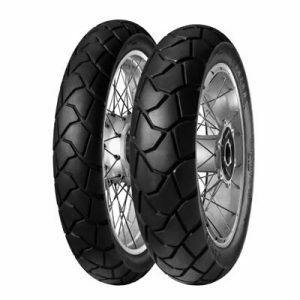 Radials provide a smoother ride, while bias ply tyres offer more stability in the sidewall. Sidewall stability is particularly useful when riding off-road, more so when standing as it aids control and tracking in slower technical conditions. The sidewalls of a radial easily flex to allow greater vertical deflection. On road this isolates the rider and machine from uneven terrain, translating into a smoother, softer ride. Anlas have taken the Radial steel belt one level higher by developing a 0 Degree Steel Belt, specifically for motorcycles. This technology can be found in both the Capra R and Capra RD range. How does this differ from conventional radial steel belts? Instead of the steel belt being at a conventional 90 degree angle to the bead it is now in the same direction as the rotation of the wheel i.e. it is at 0 degree to the bead. The benefits of this are increased stability at high speed, less rolling resistance and higher mileage/increased tyre life. Tyres are made of a conglomerate of different materials. In many instances, several types of rubber are vulcanized to produce the desired characteristics. If a tyre is heated past this vulcanization temperature (e.g by running under- inflated), it starts to deteriorate. Once overheated the tyre does not come back to its original vulcanized state. It reverts to a different state with completely different properties. The rubber may get brittle or you may witness other problems such as coking or de-lamination. Heat buildup can be checked by monitoring your air pressure when cold and then after operation — the hot temperature pressure. A good rule of thumb is that your air pressure buildup during operation should not exceed 25 percent of the initial cold pressure. Radial tyres dissipate heat better than bias ply tyres, which allows them to travel at higher speeds for greater distance. 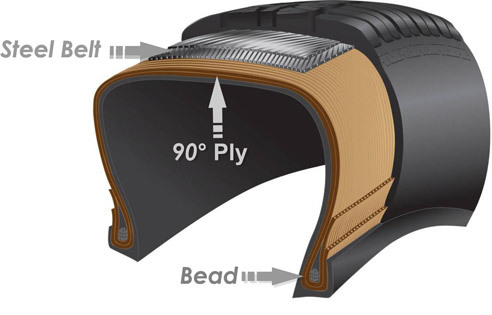 Due to a rigid, shallower street orientated tread, single ply construction (with the absence of multiple nylon plies), radials are much more effective at reducing heat build up. Conversely, Bias Ply tyres with deeper treads and multiple plies are very sensitive to overheating and should not be run under-inflated for protracted periods  e.g when returning to tar roads ALWAYS re-inflate your tyres to the recommended manufacturers tyre pressure.